Two thumbs up to films that still celebrate people's authenticity. Because for me, it's so much more than that. It's about family, friendship, music, independence... all rolled within a tender playlist of songs you'll catch yourself humming to days after. Here's a slow clap to Keira for pulling off that effortless ease of a girl-next-door (how perfect can she get??! Lol!) who doesn't care about what anyone else thinks. Not caring what anyone else thinks, that is refreshing. In the day and age where we constantly check how many likes our shared links have, and the number of our followers on all social media platforms, it's great to get hit in the head with an honest movie once in awhile. ... And the feeling of not being entitled to anything. 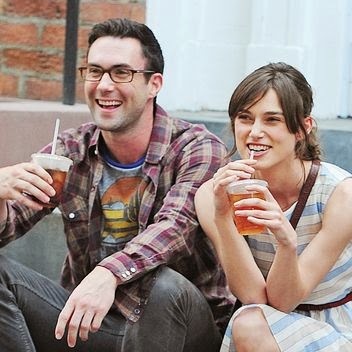 Keira's character in the story exhibits that -- just walking along the streets of New York, singing her songs, getting coffee for her rock star boyfriend -- she does things, just because. I am guilty of this -- feeling like you deserve this and that -- and when you don't get it, you become disappointed and frustrated. But living as if you don't deserve anything (grace-filled living) and giving without expecting anything in return -- that's authenticity. Being perfectly at peace with just being you, without feeling the need to strive and perform -- that sort of unassuming stance just shines through. I hope that more and more people will find beauty in these traits.